It overwinters in a cocoon beneath bark or in orchard debris. Physical Description: This one-inch long caterpillar is pink with a brown head. The adult is a grayish brown moth with lacy brown lines on the fore wings and pale, fringed hind wings, and a wingspan of about 3/4 of an inch. The solitary, flat eggs are white and are laid on leaves, twigs or fruit buds of the host plants. 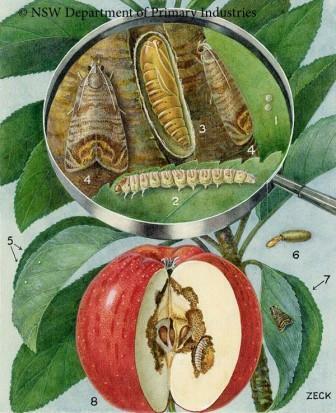 Feeding characteristics: The pest attacks the apple, pear, quince, and walnut trees. 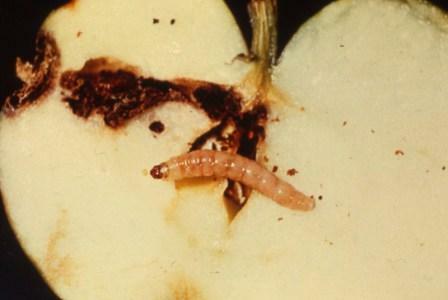 The larvae feed by entering young apples at the blossom end, 3 to 4 weeks after the petals have fallen from the blossoms, and when full grown, tunnel out leaving brown excrement on the outside. Later in the season, second-generation larvae enter fruits from any end. Controls: The Braconid Wasp and some Trichogramma Wasps are natural predators that can help control problems. You can also wrap the trunk, in early spring, with corrugated paper. Another way to trap the species is to apply a band of Tanglefoot at the base of the tree in July to catch the larvae or caterpillar as they crawl down the tree after leaving the apples. They will crawl downward seeking a place to spin a cocoon. You can also spray the trees with ryania, dust with sabadilla (for the larvae) or, during the egg stage, spray with a dormant-oil solution.